The grime MC was critical of Britain’s Prime Minister during a speech at the GQ Awards. 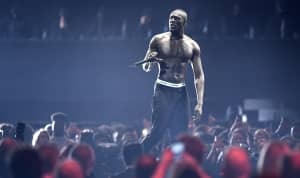 Stormzy was at the British GQ Awards in London on Tuesday night, September 5, where he picked up a prize from Labour leader Jeremy Corbyn. During his acceptance speech Stormzy thanked Corbyn and said "I do want to use this to say Theresa May is a paigon and you know what we're doing right now. It's awkward when I saw that, innit?" However, in a now deleted tweet, Tony Blair's former spokesman Alastair Campbell quoted the MC as having called the U.K. Prime Minister a "pig." This led to some confusion among political journalists online. However, Twitter was on hand to correct him and anyone else whose slang needed updating. A paigon is simply a term for someone who you don't like or a 'snake'.